In metaphysical circles or crystal therapy, opals are a semi-precious water element gemstone that is known to be helpful for enhancing dreamwork, assisting spiritual journeys, or a number of other healing purposes. There are many different color variations of opals. The type you get can have different potential healing properties. For example, opals that are clear, white, or water opals have been used as gazing tools as a way to look inward, like a spiritual mirror, promoting introspection. Fire opals (ranging in color from orange to red) can be used to stimulate change or manifest your ideas. Fire opals can spark imagination, awaken your intuition, and enhance clairvoyance. They have also been associated with improving circulation. Fire opal Reds and oranges Stimulates change, manifests ideas, can assist you in revealing deep mysteries of life, and is associated with improving circulation. Andean opal Swirled with pink, black, beige, and blue Assists spiritual travel. Slip this stone in your pillowcase to assist astral dreams. Black opal Black to gray Grounding stone, and can be used as a gazing stone for gaining insight. Facilitates the third-eye. Blue opal Ranges from bluish white to deep blues Helps open the third eye, soothes the throat chakra, and encourage telepathic communications. Brown opal (Boulder) Brown with or without fire colors Clears "muddy" aura, clears mental confusion. Cherry Opal Clear stone ranging from orange-red to pink-red Grounding stone helps you focus, and assists with clairvoyance. Golden opal Orange with no fire Helps to disperse and release any negative energies stuck in the lower chakras like the root, sacral, and solar plexus. Green opal Green Dreamwork aid that promotes relaxation and assists theta state of awareness. Can also serve as a catalyst or energy booster. Pink Opal (Peppermint candy stone) Colors range from pink and white to lavender and cream Offers inner-knowing guidance, teaches love. Assists entry into a meditative state. Addresses emotional issues, and offers nourishment and support to the heart chakra. Red opal Red Diffuses anger or aggression, clears the mind of chaotic thinking, and balances right and left sides of the brain. White opal Milky white Stimulates the crown chakra, gives mental clarity, and enhances business practices. Calming stone. Water Opal Clear Clarifying crystal. Gazing tool for the visual seeker and aids life and after-life transitions. The folklore surrounding this particular stone warns to take special care of this stone. If you lose or damage your opal, then beware, bad luck may follow. Some believe that opals are unlucky in general. Gemstone sellers should warn buyers of the fragility of this stone. The shine or polish or your opal can wear down when exposed to the earth elements. It is not a good idea to wear your opal ring when gardening or at the beach. Dirt and sand granules can dull its sheen, or even scratch it. An opal may not fare well in extreme cold or heat. If an opal is kept in a glass display case under a heated lamp, it could crack. 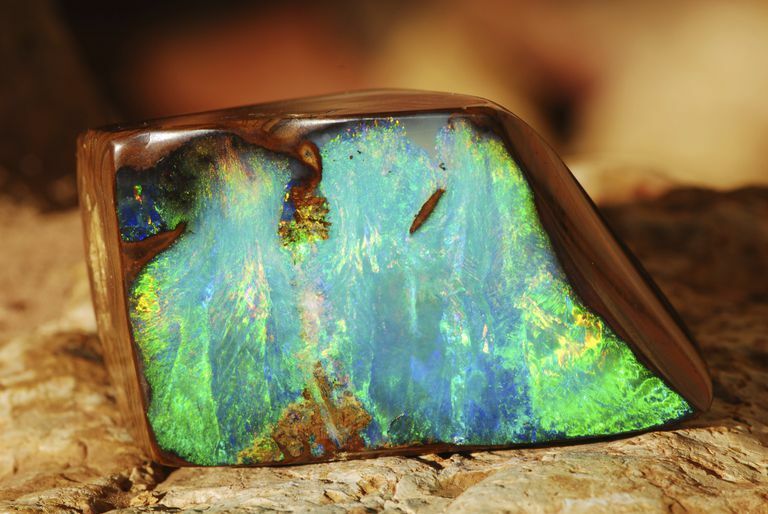 Opals should be moistened often with a natural oil or water. If all the water evaporates out of the stone it will become fragile and break. Because there are so many different types of opals, it is best to ask the gem dealer about special care at the time of purchase. Opal is considered to be one of the seven sacred stones of the Cherokee people. White opal functions much like caffeine. It brings a great deal of energy to your body and helps you get more done. It can charge you, make you more productive. White opal works mainly on the physical body but also the mind as it makes you want to do more as well as have the energy to do things. An opal is believed by some to contain moon and sun energy. It is basically a moon's stone or female energy, but it has flashes of male energy in the iridescent colors, which is derived from the sun's energy. These flashes encourage intuition and insight and represent an inner fire that gently stimulates you towards the spiritual realms. An opal can be used to help you fade into the background or become less conspicuous. It is a stone of happy dreams and good changes. An opal can be used to help you open you mystical side and give you an understanding of the higher powers.